Photo Credit: roXplotion /// Pictured: Krist Novoselic (left) and Andy Zipf of The Cowards Choir (right). DC rockers The Cowards Choir and The Beanstalk Library got to add another rock and roll story to their journals this week: performing with Nirvana bassist Krist Novoselic. The instrumental cover collaboration of Lorde’s Grammy-winning song ‘Royals’ happened on Sunday, March 9 at a FairVote event hosted by Republic in Takoma Park. The performance – which featured Novoselic on accordion – has since been mentioned by several musical outlets online including Pitchfork, Stereogum, and Rolling Stone. But how did these two DC-based bands land one of the most unique gigs of their professional lives thus far? 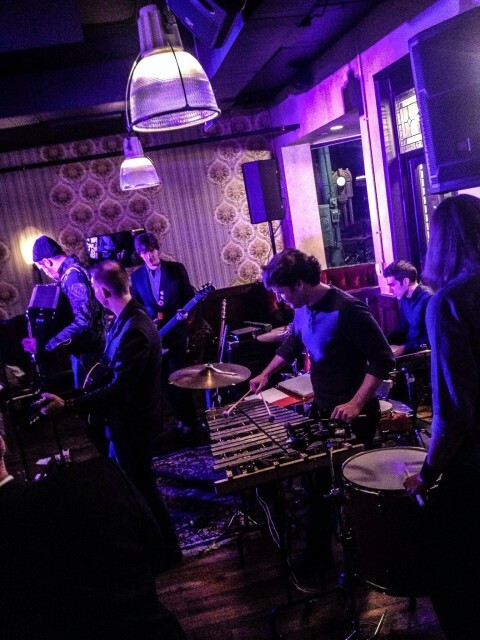 Photo Credit: Kate Moran /// Pictured: (L to R) Krist Novoselic (accordion), Andy Zipf (guitar), David Gassmann (bass), Mike Smirnoff (percussion), Adam Neubauer (drum set), and Ryan Walker (floor tom). The Cowards Choir and Beanstalk Library got involved with the FairVote event shortly after meeting Catherine Rytkonen of Republic – where the event was hosted – when Andy Zipf (lead vocals/guitar, Cowards Choir) and Ryan Walker (bass/keyboard, Cowards Choir and lead vocals/guitar, Beanstalk Library) met at the Black Rock Center For The Arts. Zipf and Walker had just performed original songs as part of The 9 Songwriter Series and Rytkonen became an instant fan inviting them to play at Republic sometime. Rytkonen’s invitation snowballed quickly after she saw The Cowards Choir open for Justin Jones at DC9 on February 11. A few days later, Rytkonen reached out to Ben Tufts (percussion, Cowards Choir) asking to see if there was any interest in jumping on a bill for the FairVote event. Zipf then proceeded to invite Walker and The Beanstalk Library to round out the evening’s musical line-up. Zipf wasn’t alone in his thoughts and preparation. “One of the things that cracks me up about it is how weird the whole thing was from start to finish. It reads like some kind of bizarre dream,” Walker said. As Walker recalls, the bands knew there was a chance that Novoselic might decide to join them for a cover or two so they tried to work a few well-known “politically motivated” songs into their repertoires. Then, they got an e-mail. Novoselic wanted to play Lorde’s ‘Royals’ on accordion and he wanted the bands to join him. Both bands assembled to form what they described as a supergroup combo featuring Zipf on guitar/harmony vocals, Walker on harmony vocals, David Gassmann on bass (Beanstalk Library), and percussionists Adam Neubauer and Mike Smirnoff (Cowards Choir). 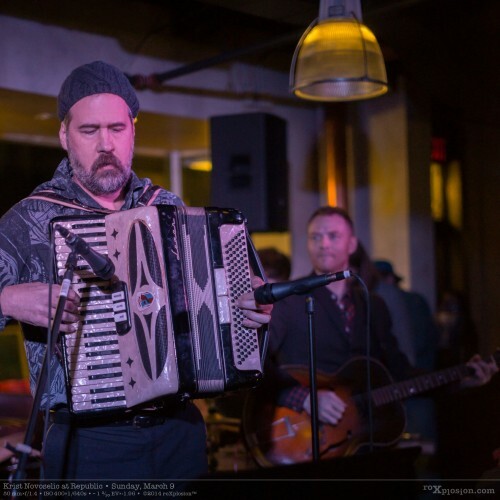 When the time came for the actual performance, the stage microphones were pointed toward Novoselic’s accordion, prompting the instrumental collaboration YouTube viewers are now being treated to. In those initial moments, the supergroup was temporarily thrown for a loop due to the pre-planned vocal harmonies they rehearsed being nixed, but that didn’t bother them. They just went along with it. “It became something of a comedy of errors at first,” Walker recalled. As far as Walker and his bandmates could tell, Novoselic wasn’t trying to throw them off at the last minute. To them, it genuinely seemed like the instrumental rendition of the song was Novoselic’s plan all along. Either way, they didn’t really care. They were still sharing the stage with a member of Nirvana. “You grow up with Nirvana’s music and, on an intellectual level, you know they’re all just regular guys when they’re not rocking out but then you actually meet one of them,” Gassmann said. 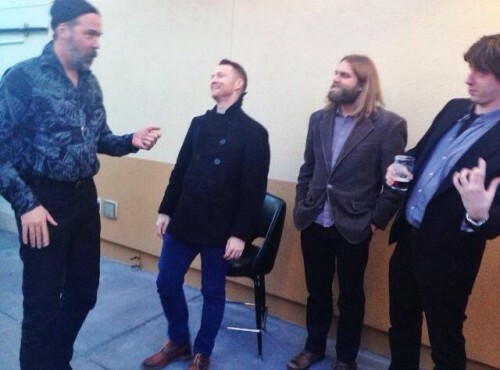 Photo Credit: Catherine Rytkonen /// Pictured: (L to R) Krist Novoselic, Andy Zipf, Ryan Walker, and David Gasmann. All that fun Zipf and the guys were having on stage made its way into the audience too. DC-area artist and frequent concert goer Kate Moran knew something special was going to happen as she watched Novoselic take the stage. He towered over everyone as he walked up the aisle to the front while carting along a large accordion, she recounted. The Cowards Choir will be at IOTA in Arlington, VA on Saturday, April 5 with the Lauren Calve Band & The Moon and You. The Beanstalk Library will be co-headlining IOTA on Saturday, March 22 with Alex Vans and the Hide Away. They also have a new single out now called ‘Whiskey Mountain’ in memory of the late Sean Meyers who was the original bassist for Norman Rockwell.